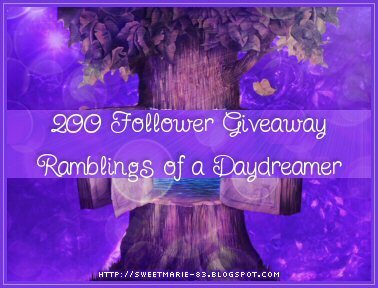 Ramblings of a Daydreamer: 200 Follower Giveaway!! Welcome to my very first giveaway! I'm so thrilled to have reached just a little over 200 followers on my blog. When I first started this blog, I honestly didn't think anyone would read it. It was just a place for me to share little bits of my life, and then I discovered a group of wonderful people: book bloggers - people who love books as much as I do, and love to talk about them, share their experiences, make recommendations, and show their generosity. Being a book blogger has been a great source of joy for me; not only have I had the chance to 'meet' literally hundreds of fellow book lovers, but I've also had the opportunity to talk to authors, as well. Very exciting stuff to a wannabe author! So, onto the good stuff! For most of the month of September, I'm going to be hosting this giveaway for my wonderful, lovely followers. *You must follow Ramblings of a Daydreamer. *ONE winner will choose ONE book of their choice from the list below. *This is open to INTERNATIONAL followers as long as you see your country listed here. *There are extra chances to win, which will be explained below. *This giveaway ends on Friday September 23rd, 2011 at midnight EST. *Winner will be chosen and announced on Saturday September 24th, 2011 and will be notified by email. I will also announce it on my blog and Twitter. Winner will have 48 hours to respond to email, and if I don’t hear from the winner in that time, another one will be chosen. *Any personal information you give me (real name, email address, home address, etc) will remain private, but must be accurate so that if you're chosen, you can receive your prize! When filling out the form, please provide direct links*. The required parts are starred, but all the extra entries aren’t required - I like being connected with fellow book lovers/writers/bloggers, and it gets you extra entries, so it's win-win. I figure you can never have too many book loving friends! The more you do, the more entries you get and the more chances to win! There are a maximum of 19 entries for this giveaway. Thanks again to all my wonderful blog friends, I appreciate you guys so much! Good luck! Yay! Congrats on the followers fellow canuck blogger! :) Thanks for the giveaway! What a great list of books to choose from! Congrats and thanks! :) The book blogging community really is amazing, isn't it? Contratulations on reaching 200! I have a fondness for this milestone as it was reaching 200 that inspired me to start the Blogging from A to Z April Challenge. The next hundred will probably come quickly for you. Congratulations Marie on reaching the 200 follower Milestone and thank-you for this wonderful giveaway. Congratulations on 200 followers Marie! Thank you for being friends on goodreads and twitter too. Best wishes and thank you for opportunity to enter your competition from the UK. Congrats on the 200+ followers, and thanks for the giveaway! Congrats to 200 followers, here's to many more! Thanks for the giveaway! i feel so bad i wasnt able to leave a comment yesterday since i had no net, but i just wanted to let you know that i think your blog is wonderful and congrats on all the awesome followers! Thanks for commenting on my blog Workaday Reads. I am always excited to find other Canadians online. You'd think we live in a small country by the way it thrills me. Hope your polishing stafg goes smoothly and you can jump to publishing and promoting quickly. New follower. AWESOME giveaway! Thanks! Hi I really like u're blog!! !